Japanese electronic component makers are looking beyond a fickle smartphone market that once lured them with rocketing growth, tying their fortunes more closely to the most resilient of Japan's big industries: automobiles. Component makers such as Murata Manufacturing Co Ltd and TDK Corp are capitalising on rising demand for electronics like those that make cars safer with automatic braking or less polluting with engine controllers. In contrast, Murata and others are having an up-and-down ride shipping components for Apple Inc's iPhones, while declining smartphone orders were a factor in January when TDK slashed its full-year operating profit forecast. The auto industry offers a stable alternative, especially because of the enduring prominence of compatriot automakers such as global leader Toyota Motor Co. The value of electronic components per car will grow 26 percent over the decade to 2022, according to Fuji Chimera Research Institute. But the payoff may not be as quick and will favour those with a longer history in the business. "TDK and Murata were early to start working in automobiles and are strong there," said Manabu Akizuki, executive director at Nomura Securities. "Moving into automobiles is not so difficult but it takes 10 years to bear fruit." Murata is the world's largest maker of ceramic capacitors used to control power supplies in electronic gadgets. It gets 40 percent of its sales from smartphones, including the iPhone for which it has been a major supplier since 2010. Orders were hit earlier this year when Apple curbed output of the iPhone 5. It now aims to rely less on smartphones and boost autos' share of sales to 20 percent from 15 percent. "Once we have products in place to expand our sales of power-supply parts, we expect to be able to generate growth that can match (that of our components for) smartphones," President Tsuneo Murata said in an interview last month. Global smartphone demand is growing 30-40 percent a year, but this is likely to slow to 10-20 percent after about two years, he said. Others in the industry also bemoan smartphone volatility. "In December, (orders for the iPhone) were cut in half," said one senior executive who declined to be named. "Then they fell by half again. At that time, I thought: 'We'd be better off not doing this. The inventories just pile up.' It took four or five months to work them off. A smaller company would've gone under." Murata has acquired several companies to bolster its position in autos, including Finnish microelectro-mechanical sensor maker VTI Technologies, bought in 2012 for 20 billion yen ($200 million). The sensors, which detect a car's movements, are used in stability control systems to prevent skidding that can cause accidents. 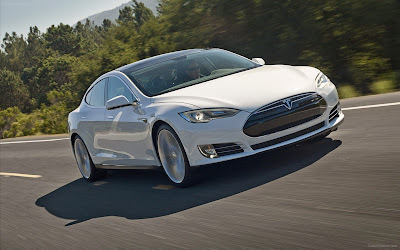 Hybrid and electric vehicles such as Tesla Motors Inc's all-electric Model S have multiplied the opportunities for electronics manufacturers, especially battery makers Panasonic Corp and Hitachi Ltd. Batteries, motors, car navigation systems and other electronics account for 50 percent of the value of an electric-powered vehicle compared with 20 percent for a gasoline-powered car, according to estimates from the Ministry of Economy, Trade and Industry. "The value of electronic materials and parts per vehicle will increase by factors of 10 with electric-powered vehicles," said Moritaka Kamiya, head of TDK's auto sales division. TDK, which began supplying magnets for windshield wiper motors in the 1960s, bought German electronic parts maker Epcos for 200 billion yen in 2009. That saddled it with a declining business supplying parts for Nokia Oyj mobile phones, but also gave it sensors for car air conditioners and expertise in component modules, which offer higher margins than parts sold separately. Other electronic components makers targeting the auto sector include Rohm Co Ltd. It increased its share of revenue from autos by 2 percentage points to 25.6 percent in the fiscal first half, and in September announced a tie-up with Freescale Semiconductor Ltd's Japan unit to boost its overseas business. Nidec Corp, like TDK, has seen its hard disk drive component business shrink because of declining PC demand. In consequence, it has shifted focus to automotive uses such as windshield wipers and power steering. The investment necessary to enter the market is substantial, says Nomura's Akizuki, but the stakes promise to be considerable. The total market for automotive electronics will almost double to 26 trillion yen in 2022 from 14 trillion yen in 2012, according to Fuji Chimera Research Institute. "There isn't the sharp growth and contraction that smartphones have, but it will steadily increase," said Shoji Sato, executive director at Morgan Stanley MUFG Securities.